Of all the TPW Brompton upgrade parts we offer, certainly the most functionally ambitious, dare we say exciting, is a kit to add a third rear cog to the drivetrain. A 6-speed Brompton becomes a 9-speed, while lightweight 2-speeds can become 3s, actually losing weight in the bargain thanks to titanium. While >95% of customers find Brompton's stock 6-speed gearing adequate, people riding in steep hilly areas, especially loaded tourists, know that a Brompton's factory-lowest low gear is (a) not always low enough and (b) entails accepting quite a low top gear. TPW's triple cog kit extends a 6-speed Brompton's gear range from 302% to either 368 or 390%, extending the high and low gears alike. The difference between stock 6 and TPW 9 is comparable to the difference between Shimano's popular Alfine 8 and 11 gearhubs. (Brompton's is lighter and more efficient than either of those, but with coarser steps). For example, using a 44T chainring (Brompton's "reduced gearing" option), the low gear can drop from 28 to 23 gear inches, while the high bumps from 85 to 92. Does this sound like modest gain? It is, but honestly it's just enough in my opinion. A broader range can be had at much higher expense and weight, but I'm hard pressed to conceive of many real-world scenarios where a much broader spread is worthwhile. I've been running this new sauce on my Brompton for the last couple weeks of foul weather, so not much, but still enough to know it's a keeper. Around town, I have no need for the bottom gears even without this upgrade, but I do appreciate the higher top end already. I plan a 400-mile loaded hilly tour over Spring Break: that will prove things. 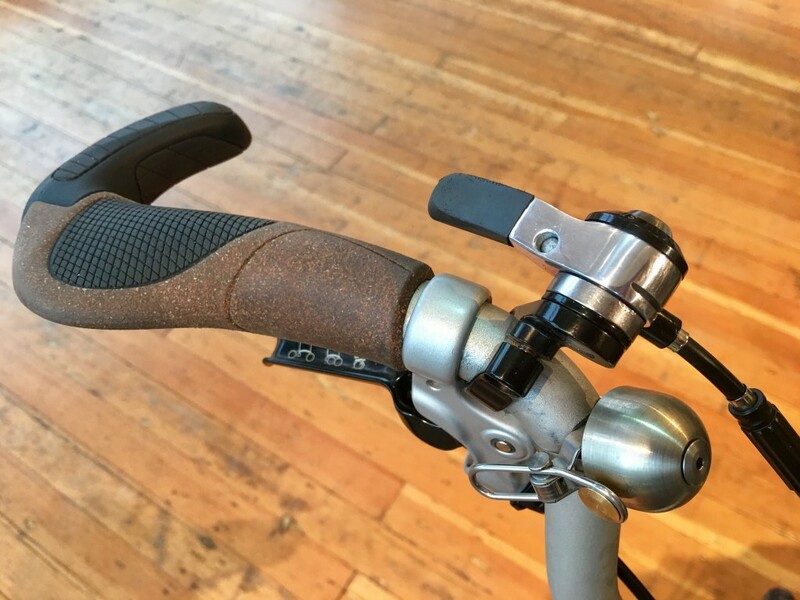 This modification has been a semi-legendary hack among the innermost nerdcore of Brompton modders for at least 10 years, requiring some combination of frame modifications and/or custom part fabrication. TPW has now packaged it masterfully. The double cogs come off, and are replaced with 3 titanium ones more closely spaced. Then you swap in a narrower 10 or 11-speed chain, and next replace the factory 2-speed shifter with a 3 according to your ergonomic and aesthetic preferences. Brompton's top idler wheel of the derailleur gets replaced with a beautifully machined metal one on bearings. Finally, the derailleur cage itself, which Brompton calls a "chain pusher" because English, gets replaced with a titanium one having roller bearings in contact with the idler. These upgrades support the greater precision required to shift reliably among more closely spaced cogs, gaining smoothness, and both lower weight and maintenance in the bargain. Installation on my bike hit some snags, and yours might also require problem-solving skills. That's why we strongly recommend you let us perform the conversion, as our bag of tricks is bigger than yours, and supporting your troubleshooting efforts at a distance may be frustrating for us both. So this is a product that comes with a service: a project. If you buy the Brompton from us, and opt for the conversion at time of purchase, we'll waive a labor charge; otherwise $70. At this writing, parts cost is a little over $500, less than the much heavier alternative ways to extend a Brompton's gear range similarly. To elaborate, Brompton's tolerances assure accommodation only of Brompton's drivetrains: certainly fair. Fitting a 19-tooth cog, sometimes it will collide with the chainstay. Fixing involves either re-spacing the wheel, or filing a bit of chainstay (not structurally significant), or even a little of both. My bike needed neither of these interventions, but something else: part of the dogleg was hitting the stop brazed onto the chainstay when attempting to shift to largest cog. We ground off a millimeter or so of offending part, et voilà! 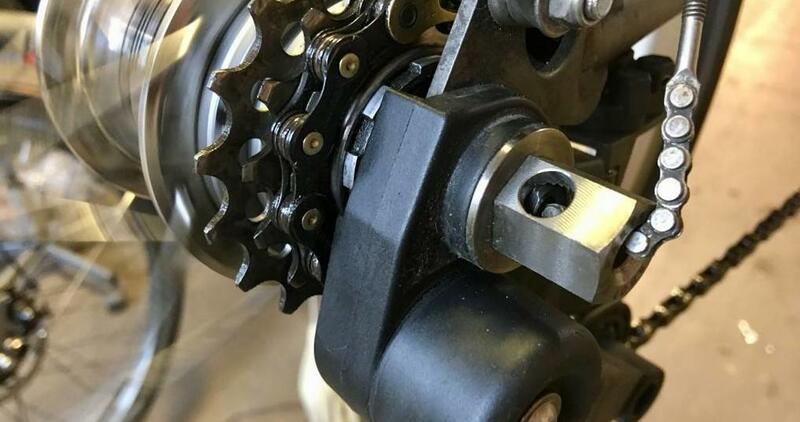 We owe a debt of gratitude to Parisian Brompton specialists Cyclodonia, whose descriptions of Ti Parts Workshop (and other Brompton bits) parts are the best we've seen, with very nice photos too. Google will translate for you as required; the Chrome browser will offer to do so automatically.